On Saturday I went on a photography tour that is a great way to experience Buenos Aires, and I strongly recommend that everyone place Fota Ruta high on a list of things to do in Buenos Aires. I put tour in italics since this turned out not to be a guided tour at all. Plus, it’s not just for photographers. 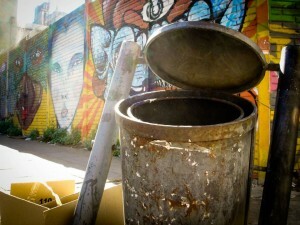 Every Saturday afternoon Foto Ruta has a gathering that explores a different neighborhood of Buenos Aires. This past weekend focused on San Telmo. The meeting location was a small restaurant on Balcarce. When I first got the email indicating the starting point I knew this was going to be slightly different from other encounters with touristic operations. Balcarce is one of my favorite streets in San Telmo but absent the large crowds that stream down Defensa. A few people were mingling in front of the resto when I arrived and a couple more soon joined. I was expecting Joss, one of the people who runs Foto Ruta, to appear, chat with us a for few minutes, and then lead us down the street. After all, that’s the typical walking tour routine. Instead, we went into the restaurant where Foto Ruta staged a much bigger production than I imagined. On a table were nicely spread out several photography books for us to browse and an abundance of handouts, even including a lanyard (which doubled as a camera strap). I had to inquire who was their graphic designer since all the Foto Ruta publications were extremely well designed as is their website. Turns out the credit goes to Joss, who has a background in graphic design and photography. Her photographic understanding became even more evident as the afternoon went by. The first forty-five minutes of the tour is spent sitting in the restaurant, which offered a good opportunity to get to know the others who have come on the tour that day. In my group were a guy from Iceland living in Sweden, two young women from the UK, and two other expats residing in Buenos Aires. Joss presented an overview of Foto Ruta, explained the concept of the tour, a brief history of the barrio, and then proceeded with a wonderfully illustrated presentation (on a large screen) about ways to compose better photographs that was filled with really useful advice and examples. The innovative approach of Foto Ruta is that it’s not a guided tour showing you a dozen picture perfect spots for taking those quintessential photos of Buenos Aires. Rather, Foto Ruta is about helping you see beyond the touristic surface of a barrio and along the way you find the wonderful images that resonate with you. On a Foto Ruta excursion you go off on your own or with a small group if you so choose, then meet back at the restaurant in a couple of hours to review a selection of photos that everyone took that afternoon. To aid that process of discovery Foto Ruta provides a map, a list of useful phrases in Spanish, and, most importantly, a set of ten clues to stimulate your visual thinking. These clues are not the mundane “Find the old bar at the corner of Plaza Dorrego”, but a brief phase: Dorrego Daydreams. The interpretation is yours. And isn’t that the key to a great travel experience? We’re each internalizing our own encounters with a place. And photography can help express that in imagery. On Saturday I teamed up with Oli, the Icelander residing in Stockholm. That’s also the great benefit of Foto Ruta: a chance to make new friends. Over a couple of hours of wandering a neighborhood you have a lot of time to talk, maybe sit down in a cafe for a coffee. Oli turned out to have a fantastic eye for photography (not surprising that he carried two film cameras and one digital). Here’s a photo Oli took for the clue “A pigeon’s picada”. Even though I know San Telmo incredibly well, having lived in that barrio from 2005 – 2008, I still encountered new sights. And the neighborhood has changed in the last few years but much has remained the same. We wandered in a bookstore filled with old books. No other customers in the store but in the back was an old man with long white hair. After glancing at him I had to turn and look again at the object in his lap. 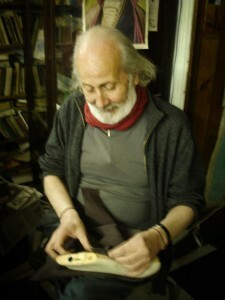 He was making shoes. After a conversation it turned out that he’s a custom shoemaker who will measure your feet and craft a pair of shoes by hand. Stumbling across that type of encounter makes for a memorable afternoon. Oli and I returned to the restaurant where Joss and her Finnish assistant Sari had bottles of wine waiting. The others soon arrived and everyone selected a photo that best matched each of the ten clues. Even if you’re not so into photography this made for a wonderful Saturday afternoon. You don’t even have to take photos; you can team up with another. And there’s no wrong answers when seeking out photos for the clues. You can be quite abstract and conceptual, plus most clues are quite broad and open to interpretation. As we’re sitting around drinking wine and chatting Sari copies the photos from everyone’s digital cameras and then Joss turns on the large screen monitor so that we can see the photos. Joss provides an excellent but gentle critique of the photos. This is not a graded exercise and she deftly finds something good to say about every photo. Indeed, some of the photos are quite remarkable. Check out the gallery page on Fota Ruta. Seriously, if you’re into photography and you’re in Buenos Aires or visting the city then you’re going to enjoy the Foto Ruta experience. In addition to the Saturday excursions Foto Ruta also offers half-day and full-day workshops on street photography, a half-day on iPhoneography, plus a full-day post production workshop. That’s an exciting set of opportunities for anyone interested in photography. I love Fota Ruta’s concept for getting people to truly experience the streets of Buenos Aires. You won’t learn anything about the history of a 19th century military leader and politician named Manuel Dorrego, but you’ll surely come away with lasting memories and new insights in photography. Without a doubt, Recoleta Cemetery is the most enchanting spot in Buenos Aires. Even after dozens of visits I still discover a new aspect: a tomb gone unnoticed or the slant of light through stained glass. Indeed, the cemetery is different depending upon the time of day and weather. And there’s all that history of Argentina represented among the dead. Wandering the cemetery on one’s own is always a pleasure. Back in 2007 I had the opportunity to take a tour of Recoleta Cemetery with Robert Wright, who led tours not just of the cemetery but elsewhere in the city. But Robert no longer provides those tours. Robert and I teamed together to form Endless Mile, an initiative to create a set of digital guidebooks to Buenos Aires and other cities. Our very first guide is to Recoleta Cemetery. 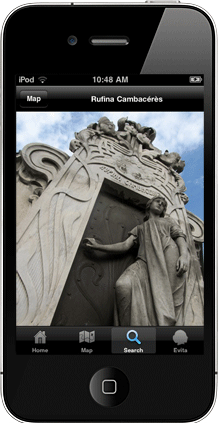 Our guidebook to Recoleta Cemetery is available either as an app for iPhone & iPod Touch. With the Recoleta Cemetery app or e-book you will get a guided walking tour with insightful entries about the 25 most important tombs, along with over 70 color photos & archival images. Plus, the fascinating history behind what happened to Eva Perón’s body is explained. I wished I had this guidebook on my very fist visit to Recoleta Cemetery in 2003. But this guide is not just for taking a walking tour. It’s also a vivid way to remember your visit & share with others the extraordinary place that is Recoleta Cemetery. My personal recommendations (a tiny guidebook, if you will) for enjoying 4 perfect days in Buenos Aires: also available as an app for iPhone. You also can use it on your iPod Touch or iPad. 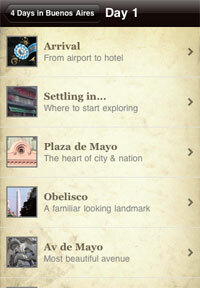 So, take a look at my first app-based travel guide to Buenos Aires. It’s amazing what you an get for a .99 cents, especially in Buenos Aires. And, hey, if you don’t want the app then go spend those a buck on a cup of coffee over at my favorite place: Bar Británico. The app Buenos Aires in 4 Days is available on the iTunes app store. I had some time to kill this afternoon on Florida street so I wandered into a few bookstores. One of the most bizarre guidebooks to Argentina that caught my eye was titled Bariloche Nazi. Perhaps the highlight of the book is that it reveals the purported location of the Bariloche home of Adolph Hitler and Eva Braun after they escaped from post-World War II Germany….. Uh, yeah. Okay, I’m trying to keep my posts to a fairly low word count…saving you, dear reader, precious reading time. So, my next odd encounter will be posted tomorrow. How much do you want to know? This afternoon at the café I read a book review which proceeded to tell me way more than I wanted to know about the book prior to reading it. I immediately remembered why I seldom read reviews of books that I want to read. And long ago I’ve learned never to read movie reviews. I rather approach things like this without much prior knowledge, just arming myself with only a vague notion of the story. The amount you know about something beforehand certainly impacts your experience. But does it enhance or hinder your experience? Likewise, what about the ways we experience a place, a city such as Buenos Aires? Obviously the parallels are not the same. But I’m curious as to what type of reading, what type of learning experience, enhances our travels? And what type of reading actually hinders our experience? Every visit to Recoleta Cemetery reveals a tomb, a statue, a plaque that I’ve not seen before. Just visiting the cemetery in the morning rather than afternoon creates an entirely different experience, the way the light enhances a stained glass window or throws shadows along the walkways. But every time I talk to Robert I learn even more about the cemetery and see details that I never noticed. Robert has done a very nice map that provides an excellent tour of Recoleta Cemetery. Now, he’s gone even further and created what I think is the definite guide to Recoleta Cemetery: AfterLife, Documenting Recoleta Cemetery in Buenos Aires. Not only is it the best way to learn about Recoleta Cemetery but, as Robert says, it’s a “new way of looking at Buenos Aires” since so much of the city’s, even the country’s, history is contained within that cemetery. But what is the point? Why did you take this trip? Somehow, I doubt if most travelers can really answer those questions. Sure, there are the obvious responses: I want to visit South America, to see another part of the world, to experience another culture. But what does that really mean? Okay, so now you’re back home with your memories and photos but what stays with you from the trip, what made it worthwhile? Perhaps it’s just the memory, the process of remembering, acquiring some sense of another place. For a long time I’ve had a personal slogan that life is about creating memories. If travel provides a set of memories, then what can we do to make those experiences more meaningful? Having a well-informed guide can reveal a dimension to a city that you might not otherwise encounter. Or, perhaps that guide comes in the form of a book or audio walking tour. My fifth trip to New Orleans was actually my favorite. I went on a walking tour of the cemeteries near the French Quarter (not sure why I hadn’t done that before), but the best part were simply the self-guided walks using Randolph Delehanty’s Ultimate Guide to New Orleans. Of course, there are guides who are not so good and tour groups that herd you around like cattle. Perhaps the most memorable experiences are those that are unexpected, even the small moments that stay with us. Maybe it’s not about seeing the sights but about appreciating a place; but that’s a vague term. In thinking of my own future travels, I’ve started to ask myself, “What do I want to get out of this trip?” And without falling back simply on a list of places to visits, sights to see, I find it a hard question to answer. Guidebooks have been my first purchase when thinking about traveling somewhere. Since there’s hardly anywhere I don’t want to go, I buy guidebooks even in anticipation of a trip decades away. Paging through a travel guide is a form of entertainment, an attempt to satisfy that curiosity about the world. I think my very first guidebook purchase was sometime around the age of 12. I remember being at Walden Books at Rivergate mall just north of Nashville and getting that slim, green Michelin Guide to Paris. I didn’t make it to Paris until I was 18 but I vividly recall tracing the walks along the maps and learning about the Musée de Cluny; I was a strange boy. What I enjoy about guidebooks are the descriptions of places, the contextual info. I skip all those pages about transport, lodging, and food. Sometimes, that means I’m skipping three-fourths of the book. Those are practicalities that arise in a different phase of travel planning. Yet, those details – updated by diligent, poorly paid souls slogging from hostel to hotel – are the essence of the guidebook. So, I’ve found myself seeking out other sources to prepare me for my travels or my fantasies of setting foot someday on a distant soil. I like to learn. I like to learn about the world. Is that a passion? As a librarian, I had easy access to a large research collection. For a trip to India, I read William Dalyrmple’s City of Djinns and Bamber Gascoigne’s The Great Moghuls. I even found an enchanting book, Sadhus: Holy Men of India by Dolf Hartsuiker, that I obtained through interlibrary loan. That combination, along with a few other resources, really enhanced my experience riding on the back of a rickshaw along the jammed, narrow streets of Old Delhi. Rather than thinking about the pain in my backside from sitting on a bouncing narrow bench, mental images from my readings of India’s astonishing history mixed with the living culture moving all around me. But most people don’t have access to research collections or would even known which books to read if they did. Guidebooks often do a very good job of referring readers to other books and that’s one of my favorite features of guidebooks. But who has time to read the best 40 books on Malaysia or even the best three? The Internet offers lots of sources but, again, it’s time-consuming to filter through all the travel sites that are simply fronts for booking reservations. For each good blog such as Travelvice or Life on the Tibetan Plateau, there is a deluge of travel blogs with photos of Uncle Joe smiling over his steak at Cabaña Las Lilas. There surely will be the emergence of even more Net-based resources that will help people prepare for a more enriching experience during their travels. But, the question is how will those resources be structured? How will they differ from and enhance existing resources available to travelers? How will they go beyond the limited coverage that can fit into a guidebook but also not be overwhelming? Why do we travel? Why do we have that desire, that yearning, to visit far away places? What is it about our lives that we seek to fulfill elsewhere? Perhaps, it’s as simple as a curiosity about the world. We’re faced with the appealing belief that there is more to life than the everyday encounters in our hometown, no matter how large. Tourists view Buenos Aires as an exotic destination, though porteños may twitch their noses, wondering why so many foreigners come here. Likewise, the curious porteño fills pulled elsewhere, possibly the very humdrum towns that we’ve gladly left behind. We all want to go somewhere else. If travel is not about curiosity, experiencing a different culture, learning more about the world (and possibly ourselves), then is it nothing more than checking off a list of accomplishments – been there, done that? For some, (many, most? ), travel may manifest itself in that competitive breed of list checkers. But I would like to think that we have a deeper sense of purpose, even if our actions don’t always reveal that core. Yet, why do most travelers learn so little about the places they visit? Are they just not that curious? Do they not know what questions to ask, how to learn? International travel costs thousands of dollars. If we pay that much for an experience, should it not damn well be life enhancing? How should we prepare ourselves for encountering a distant part of the globe? How do we learn about a culture, a society, a place that is not ours? In our travels how do we best engage our curiosity about the world? Following-up to the post about trendy stores coming into San Telmo is this photo of the words “This is not Palermo” scrawled on the wall of the new Puma store just off Defensa. See a previous post about real estate in San Telmo for a stencil on the same topic. Meanwhile, also spotted in San Telmo was this scribble on a wall along Defensa with the reminder: Let’s treat the tourists well.